The Hog Roast Bromsgrove team arrived at set up at the venue in between the other exhibitions, setting up a serving panel from which to serve the guests from, rather than a buffet table. They began the Hog Roast before the guests arrived so that they could serve the food throughout the day. The Hog Roast team has the facilities to ensure that they keep their buffet food warm throughout the event so it can be served throughout the day but ensure that they keep it fresh but warm. The different exhibitions created a fantastic atmosphere and the guests enjoyed mingling with different customers and companies. The event was a brilliant way to showcase what the local businesses had to offer and brought together some great inspiration for people’s dream weddings. The food went down fantastically with the guests attending the wedding fayre and many of the guests enjoyed multiple portions. 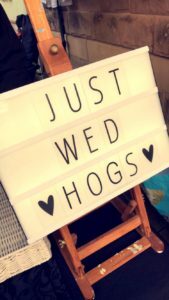 The Hog Roast Bromsgrove team ensured that there was something for everyone by providing vegetarian and vegan options, as well as catering for guests would had food allergies or required dietary alternatives such as gluten free. The service ran really smoothly and the team offered a very friendly service as they served food from the hotplates upon which they were maintaining the quality of the food. In addition, they also continued to use the hog roasting machine throughout the day to keep the meat fresh as it slow roasting, rather than transferring it all to the buffet panel at the start of the day.